DALLAS--(BUSINESS WIRE)--Feb. 11, 2019-- SOLIDWORKS WORLD – Empowering designers and engineers to embrace new 3D printed possibilities, Stratasys (NASDAQ: SSYS) is further removing complexity from design-to-3D print processes. GrabCAD Print’s Advanced FDM feature is aimed at ensuring design intent via intuitive model interaction to rapidly deliver strong, light, and purpose-built parts. 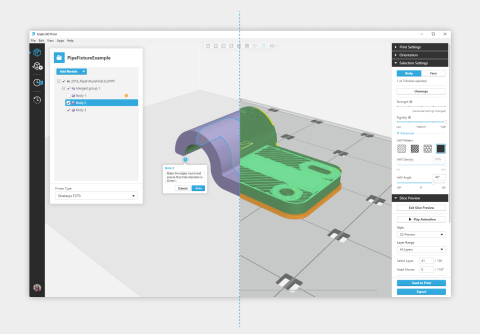 The statements in this press release relating to Stratasys’ beliefs regarding the benefits consumers will experience from GrabCAD Print’s Advanced FDM feature are forward-looking statements reflecting management's current expectations and beliefs. These forward-looking statements are based on current information that is, by its nature, subject to rapid and even abrupt change. Due to risks and uncertainties associated with Stratasys' business, actual results could differ materially from those projected or implied by these forward-looking statements. These risks and uncertainties include, but are not limited to: the risk that consumers will not perceive the benefits of the GrabCAD Print’s Advanced FDM feature to be the same as Stratasys does; and other risk factors set forth under the caption “Risk Factors” in Stratasys' most recent Annual Report on Form 20-F, filed with the Securities and Exchange Commission (SEC) on February 28, 2018. Stratasys is under no obligation (and expressly disclaims any obligation) to update or alter its forward-looking statements, whether as a result of new information, future events or otherwise, except as otherwise required by the rules and regulations of the SEC.